I attended SHOT Show 2011 in January, and had the opportunity to examine and fire the Vector SMG for myself. Whilst there are many others who have spoken on the relative merits of the weapon, I was impressed. The Vector SMG was comfortable, well balanced, and controllable during automatic fire. The high rate of fire may prove a drawback, however. The accuracy of the weapon when firing two-round bursts was impressive. The KRISS website shows one such burst here. The weapon could have a place. It came to my attention whilst talking to a KRISS representative in Las Vegas that the Australian Federal Police (AFP) had – and presumably were continuing – to test and evaluate (T&E) the Vector SMG. A few phone calls revealed, as expected, that the weapon was being evaluated by the Operational Readiness Group (ORG) for use by their Tactical Response Teams (TRTs). The ORG TRTs provide tactical response options to all high-risk AFP operations nationally, and are often tasked to deploy overseas on peacekeeping missions as part of the International Deployment Group (IDG). So why would the AFP be interested in this weapon system? Billing the Super V system as “the most significant advance in weapons operating systems in more than 120 years”, KRISS have certainly conducted a fairly intensive marketing campaign. To date it has been reasonably successful – the Vector has been adopted by a number of Law Enforcement (LE) agencies in the United States, including multiple municipal Police departments and Sherriff’s departments. I am also reliably informed that a number of other users are evaluating the weapon at the moment, including a number of federal agencies in the Philippines, the British SAS, and various units in Saudi Arabia, Thailand, and India. The AFP was approached by one of KRISS USA’s international sales agents, who directed them to KRISS Systems (the Swiss-based parent company, a subsidiary of Gamma Applied Visions Group SA). The original plan was for the AFP to acquire a weapon on a T&E loan basis, evaluate the weapon, and return it. According to sources at KRISS USA, the AFP tested the weapon, and liked it so much that they decided to purchase the loaned weapon outright. 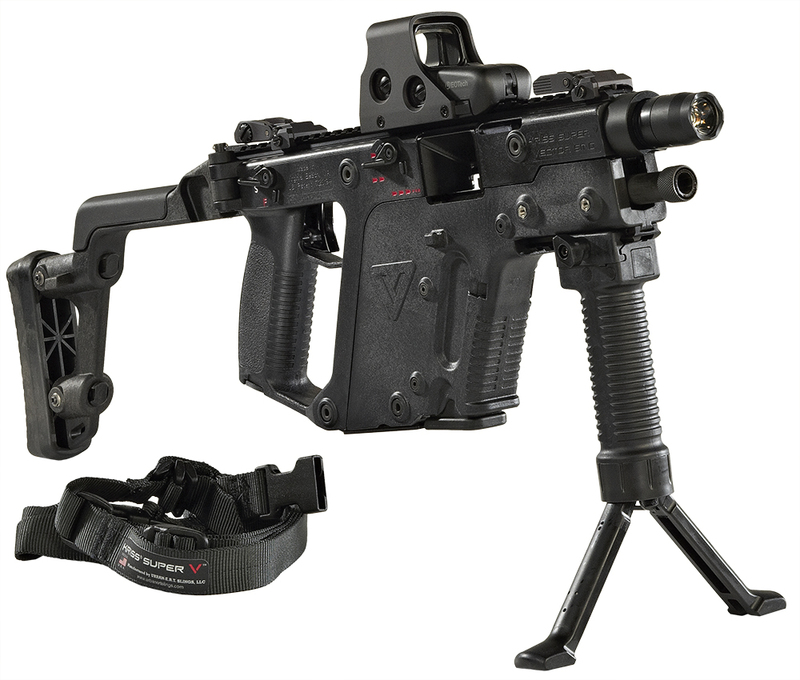 The Vector has a number of unique features that make it suitable for deployment in a CQB (Close-Quarters Battle) scenario. In such high-pressure, time-sensitive operations, the accuracy and controllability becomes key selling points; only hits count, and rounds that fail to hit their target can cause collateral damage. The KRISS representative I spoke with said that they received the following feedback from operators testing the weapon: “they liked the compactness, they liked the round… most importantly they liked how they got the stopping power of a .45 ACP round, but with the kick of a 9mm”. However, the ORG TRTs currently use the Heckler & Koch MP5 and variants, chambered for 9x19mm NATO in the submachine gun role (although they are following the recent trend towards deploying with carbines, such as the Colt M4 and G36C, in many situations), and carry GLOCK 17s/19s and Heckler & Koch USPs, both also chambered for 9x19mm NATO, as their standard sidearms. Switching to a .45 ACP submachine gun would, then, mean losing interoperability with the ammunition issued for their sidearms. Having said that, the team at KRISS have begun testing a Vector SMG in .40 S&W already, and are looking at other possible calibre adaptations. The technology itself has already been prototyped in calibres as large as .50 BMG, and KRISS have stated their intention to work on making the technology effective across a broad range of calibres. Their website states that “The KRISS technology can be easily adapted to any size caliber and any type of platform”. One advantage for many agencies adopting the Vector is its compatibility with standard GLOCK 21 magazines. The Vector will feed from standard 10- and 13-round magazines, as well as from the proprietary MagEx G30+, offered by KRISS. These 30-round magazines are also compatible with the GLOCK 21. This compatibility of not only calibre, but also the magazines themselves can be very appealing for law enforcement agencies, for a number of reasons. Not only does such standardisation have obvious tactical benefits, it also allows for logistical and economic advantage. This is particularly true for small town and county PDs/Sherriff’s departments. KRISS have also released limited information about their next generation of submachine gun, the KRISS K10. This will be designed as a multi-calibre platform, supporting .45 ACP, 9x19mm NATO and .40 S&W – the three most popular handgun cartridges in Western military and LE use. The K10 also features a lot more Picatinny rail real estate, in particular a quad-rail fore end. Reportedly, a proprietary magazine is being developed for the K10 that will be interoperable with another in-development KRISS weapon, the KARD. The KRISS KARD is a handgun based on the same recoil-mitigating design principles as the Vector. The limited information and video available show a weapon with great promise. Whilst the debate over whether or not the AFP’s ORG Tactical Response Teams should consider switching to a different pistol calibre is a discussion for another piece, the KRISS Vector SMG certainly holds promise that lies in the technology at the heart of the gun: the KSVS. The operators who had a chance to get hands-on with the weapon spoke highly of the Vector, as seen above, so whilst we may not see the adoptions of the Vector any time soon, I very much hope the AFP will consider KRISS’s future offerings – either the K10 in 9x19mm NATO, or the paired K10 and KARD in .45 ACP – as candidates for further testing. Photo courtesy of KRISS USA. Can the cyclic rate be adjusted? How easy is that? I was told that it can be, yes. As far as I’m aware the ROF can be adjusted from approx. 700rpm up to 1500rpm.